Demolition underway at the 6.3-acre Albion Dairy site in Lincoln Heights. Photos taken looking downstream from the North Spring Street Bridge. The existing Downey Recreation Center park (with green lawn) is visible on the far left. The Los Angeles River is on the right, with the North Main Street Bridge visible. I recently spotted a couple of projects that L.A. Creek Freak has reported on that are now making on-the-ground progress. In Lincoln Heights (photo above) the Albion Dairy site industrial buildings and parking lot are well on their way to being completely demolished. Information on that planned L.A. River park here. 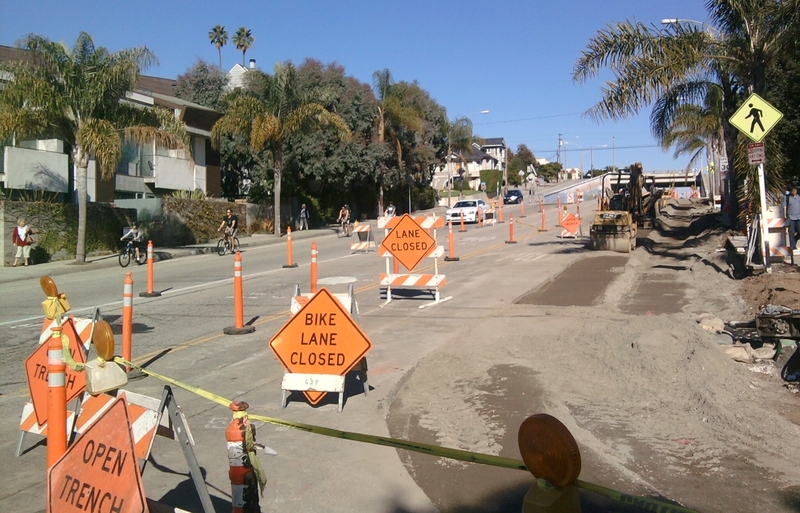 In Santa Monica (photo below) the Ocean Park Boulevard green street project is under construction. Information on that complete street project (including its green bike lanes) here. Here are a couple of videos that creek freaks will enjoy; both feature Andy Lipkis the founder and soul of TreePeople. Above, Lipkis explains the Elmer Avenue green street. Below, Majora Carter‘s (who has lots of creek freak cred from her work on waterfront restoration on the Bronx River) new Ted.com talk tells three environmental entrepeneurship tales, including Lipkis’ work to green L.A. schools. Green Street Sidewalks in Downtown L.A. I thought it was one of the best USGBC events I have ever been to in this city. It was really informative …I wasn’t planning on staying as long as I did, but I found myself so engaged with the discussions and didn’t want to leave. > UCLA Lab School plans a Stone Canyon Creek restoration planting day later this month. > The Jewish Journal reports that Heschel School has received a grant for a new L.A. River mural. > Contest! About a week to go to name all the animals in the L.A. city’s L.A. River poster and win framed artwork. 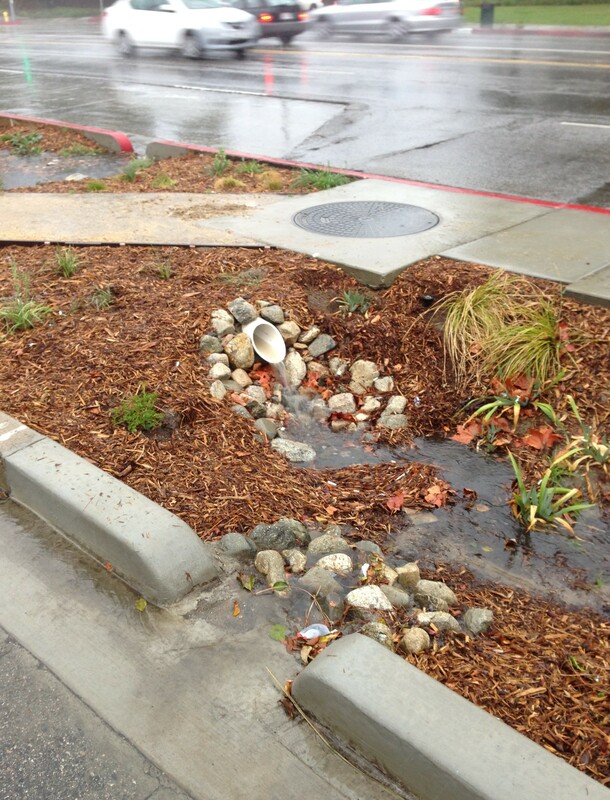 Enter your best guess in the comments at LA Stormwater Blog. >On December 7th, The city of Duarte is opening its new bioswale and outdoor classroom park at El Encanto oops! corrected 11-12-2010: Encanto Park, located on the San Gabriel River. Council President Garcetti opening the Riverdale Green Street Project. Seated, left to right, are Zaldivar, Daniels, Cardellino, and Moore. Under yesterday’s midday heat, on a quiet block in Elysian Valley, a small crowd gathered to celebrate the ribbon-cutting of the city of Los Angeles’ newest green street: Riverdale Avenue. The ceremonial opening was presided over by Council President Eric Garcetti, Public Works Commissioner Paula Daniels, Bureau of Sanitation General Manager Enrique Zaldivar, City Engineer Gary Moore, and Project Manager Joan Cardellino of the California Coastal Conservancy, which funded Riverdale’s retrofit. You are currently browsing entries tagged with green street at L.A. Creek Freak.